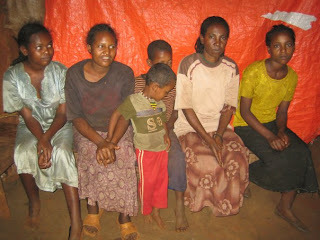 Meet Magertu Takele from Belo Central in Ethiopia (far right in the photo). She is 14 years old and has already had to grieve the death of both her parents. Magertu’s four brothers are unable to care for her as they live far away. Her neighbour (second from right) watched her mourn the loss of her parents and although her was already busy tending to her seven children and ailing husband, she opened up her home and heart to Magertu. Not long after joining this family, the father passed away from his illness. While Magertu's new guardian works very hard to provide for her family, the children's future looked bleak. Magertu has been chosen to be sponsored through Food for the Hungry’s child sponsorship programs. This has given her hope as she looks ahead to the future. Have you considered walking alongside of a child through sponsorship?